June 8, 2015; Naperville, Illinois: Bizofit, a startup based in Naperville, IL, announced the launch of its IT Services Marketplace Platform, with listings of over 2,500 IT Service Providers. The Marketplace Platform is targeted towards small, medium and large enterprises, and has full-lifecycle features to Identify, Evaluate, Select, Manage and Pay IT Service Providers. Bizofit, launched by IT Services industry veteran, Bala Palamadai, seeks to disrupt the IT Services space, by challenging the status quo – based on legacy sourcing approaches, legacy Service Providers and legacy engagement models – resulting in sub-optimal solutions, huge costs and limited adoption of Transformational Platforms in several organizations. Identifying a new IT vendor currently can take up to nine months – an unacceptably high timeframe in today’s world. Also, a little known fact is that new customer acquisition often costs as high as 20% of revenues for IT Service Providers, which ultimately is borne by Enterprise Customers. Through adoption of its Marketplace Platform, Bizofit seeks to eliminate these inefficiencies and reduce costs, and most importantly present Enterprises with Transformational SMAC-based Solutions (SMAC is an industry acronym for Social, Mobile, Analytics and Cloud). While the Platform has several attractive features, the ‘4P SUGAR Quadrants’ is a unique differentiator. 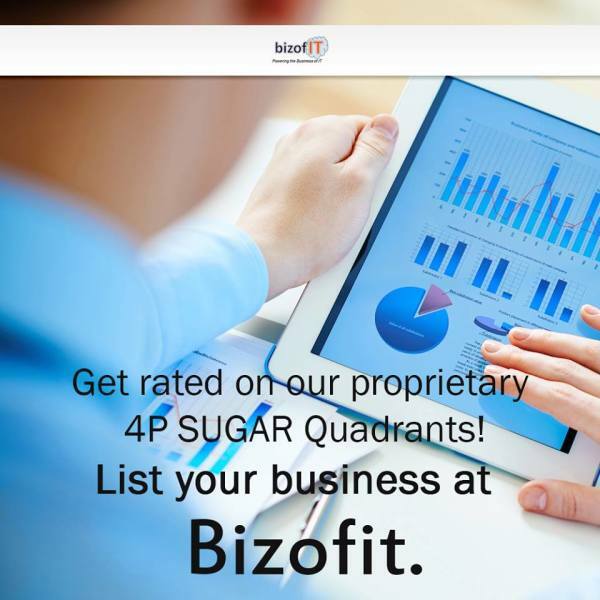 ‘4P’ refers to Bizofit’s proprietary framework for evaluating Solutions along the four dimensions of Platform, People, Process and Partnerships; and SUGAR is an acronym for ‘Specialized User Generated Aggregate Rating’. As the name suggests, this is based on Rating by Specialized Users, namely Customers and Analysts. For more information, visit www.bizofit.com. Bizofit (pronounced as ‘Biz of IT’) is the brand under which Bizoforce Inc. operates. Bizofit is a startup that helps enterprises focus on making the ‘right IT decisions’ to enable and drive business, by leveraging Bizofit’s proprietary Cloud-based Marketplace Platform for IT Sourcing. This platform has full-lifecycle features to Identify, Evaluate, Select, Manage and Pay IT Service Providers. Besides facilitating Automation, Intelligence & Measurement (‘AIM’), the Platform provides customized and objective information and insights on Service Providers and their Capabilities. In addition, Bizofit also provides Advisory Services to Enterprise Customers and Service Providers.